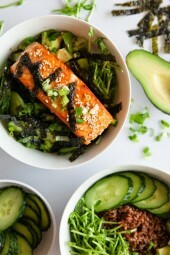 These Asian Salmon Bowls are my new addiction!! 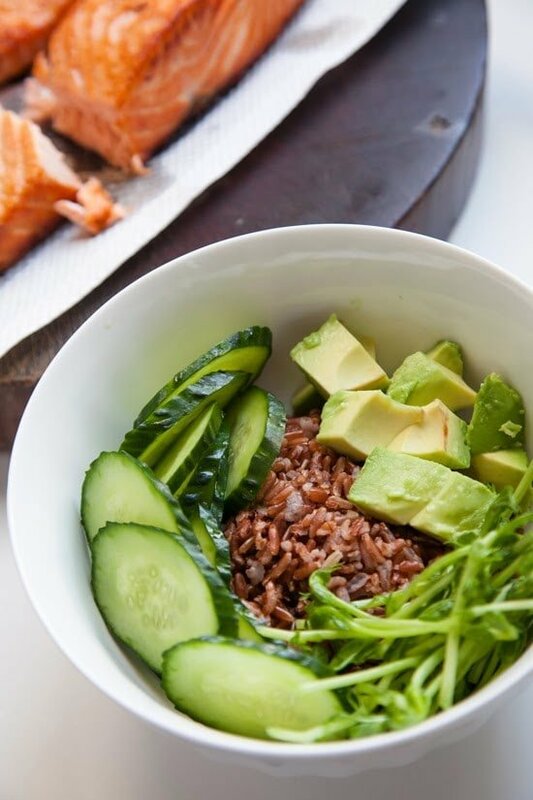 Served over brown rice and topped with cucumbers, avocado and sprouts and drizzled with a soy-wasabi vinaigrette – SO good! 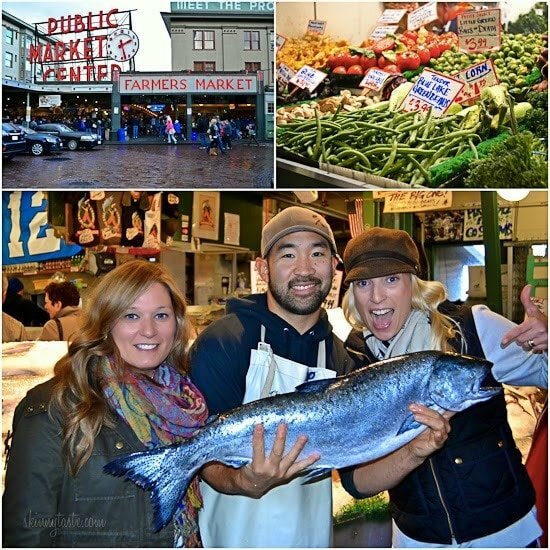 My friend Heather has been talking about these salmon bowls for as long as I know her. Finally I convinced her to do a guest post to share her sister’s recipe, and last night I decided to test it before sharing it here. Holy YUM!! It’s healthy and delicious, tastes like a dish you would order at an Asian restaurant. I know you’ll love it! Hi there, I’m Heather. I’m a dietitian, a nutrition consultant for Skinnytaste, and the founder of Smaller Size Bigger Life an online coaching program for women who struggle with emotional eating, binge eating, overeating, or body image issues. I’m so thrilled to share my sister’s salmon recipe here on Skinnytaste (thank you, Gina!). My sister Lori and I have always shared a love of cooking (and our sister Cyndi has always enjoyed eating our creations!). Lori and I swap recipes, spend hours browsing farmers markets, share cookbooks, and talk about bacon the way some women talk about shoes. We just really, really love food! Some of my happiest memories with Lori are in the kitchen – we slice, dice, and taste while we laugh, chat, and connect. And while I really enjoy cooking, Lori is the true family food superstar. If Lori’s in the kitchen, you just know the end result will be awesome! 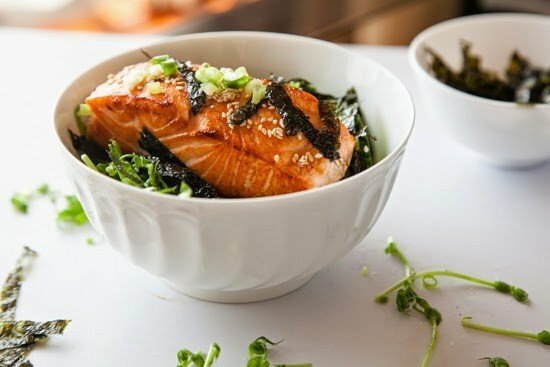 We live in Seattle so naturally salmon is a regular on the menu, and this Asian Salmon Bowl is one of Lori’s signature everyday dishes. It’s healthy, it’s tasty, and it’s ready in a snap. I’m incredibly grateful for my two sisters – they’re pretty amazing. I hope you enjoy Lori’s recipe as much as I do! Season salmon with a pinch of salt and fresh pepper. Heat a frying pan or sauté pan over medium-high heat. Spray the pan lightly with oil spray. When hot sear salmon, around 2 – 4 minutes per side (depending on the thickness of the fish). 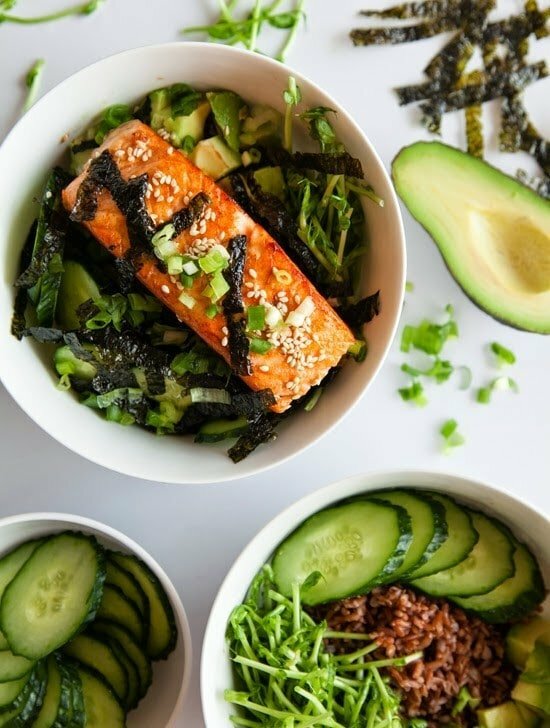 Top each bowl with 1 oz avocado, green onions, cucumbers, sesame seeds, and sprouts. 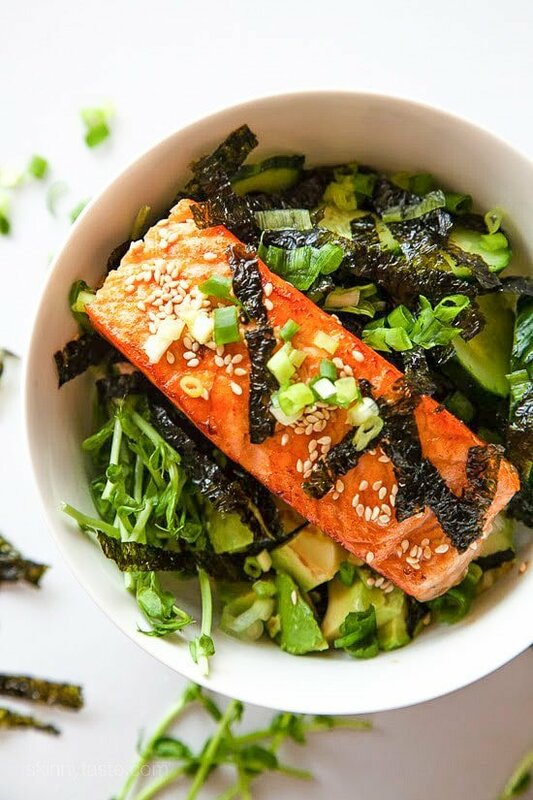 Place salmon on top of each bowl, drizzle with the vinaigrette, and sprinkle with shredded nori. I inhaled this!! It tasted just like I imagine deconstructed sushi would taste. We’ll definitely be making it again. 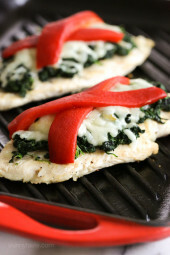 Easy weeknight meal! I really enjoyed this meal- made it with white rice & omitted the sprouts entirely. Will probably add pickled ginger next time and decrease the wasabi to only 1 teaspoon. We loved this dish! The wasabi dressing is spot on delicious. My husband is now requesting this for Friday night dinner. Thank you for posting this. This was AWESOME!!!! I’m going to make it again!! Love the menu plan and grocery list too. It’s saved me a lot of time. Thank you!! This one is a home run! Seriously delicious! Our entire family enjoyed it. Def going to be remaking this one! So good and well-balanced. Loved the crunch from the cucumbers, the creamy avocado, the sweetness of the mirin, and the chewy brown rice. I didn’t have wasabi so I added some sriracha for some spice. I’m not a huge salmon fan, but in this dish it worked so well. I’ll definitely make this again! Big hit with my husband, 6 and 4 year olds too! Made this for lunch on Superbowl Sunday as a lighter, “pre-feast” option. Fantastic! I skipped the nori (not available anywhere close to where I live!) and I used all the sauce for two servings. I had a piece of salmon that was about 7 oz. per person, and that seemed like a good amount. I also swapped out basmati for brown rice because I had it and it cooks much faster. I used my mandolin to get nice thin slices o f cucumber an radish (used a regular one because I didn’t need a whole Daikon). This is like a deconstructed sushi roll, so anything you like on sushi would work here. I think next time I might try some mango….because there will be a next time! my new favorite way to eat fish! so happy to have found this! Look s delicious! Does anyone know the points if you replaced the rice with cauliflower rice? I added some ginger as I think all things Asian flavored must have ginger. It was amazing! I made this with high protein heigh fiber buckwheat soba noodles. Oh My God! Forget brown rice! I bough online on Amazon. I substituted with julienned carrots to make it more like a sushi bowl. I think I liked it better that way! Love this recipe! It takes literally 10 minutes to make (when using Trader Joe’s precooked brown rice) and everyone enjoys it. A perfect weeknight meal. Could I substitute Quinoa instead of brown rice? can you substitute the wasabi for anything else.. I worry about the spice for company..or maybe just add smaller amount. Wow! That was soo delicious! I ended up getting bean sprouts & through in some mushrooms too. I couldn't find wasabi paste but I will add it next time, I think it would add a nice bite. Thanks so much!! Just made this – yum!! Next time I will reduce the wasabi by maybe 1/3…tiny bit too spicy but otherwise fantastic. Thanks! I loved this recipe, thank you so much! I subbed white rice for brown since I didn't have any and I used red rose radish shoots instead of daikon radish sprouts. I will make this again for sure! How could I make this low carb and safe for diabetic consumption? We love salmon. Love that your Heather is sharing this recipe with us! this Soy-Wasabi Vinaigrette is on point! totally trying this! delicious! Just made this. Overall tasty, the sauce has too much wasabi…made it hard to eat. Next time just one teaspoon! I don't know the strength of your wasabi, but here in HK it is full force! Happy to finally find a recipe for this. I've obsessed after salmon bowls after I ate one at World Wraps in Seattle, called a Samari Salmon bowl. They make this into a wrap or you can order it in a bowl, which is what I do. This is the exact recipe that they make there, but I could never figure out the Vinaigrette…so I'm anxious to make them at home now! The best recipe ever published here. My family absolutely loves the salmon bowl. I made a few teaks I thought I would share. Added edamame and pickled ginger. Also like to double the sauce but keep the wasabi amount the same. We like lots of sauce but too much wasabi makes us cry… lol. This was fantastic. I added sautéed mushrooms and steamed carrots and broccolini. Have shared it with my Facebook community as well. Great job. Made this tonight and it was AMAZING. Next time I want to try it with seared tuna. 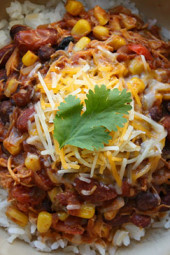 I made this for dinner tonight and it is now a favorite! So delicious and unusual. 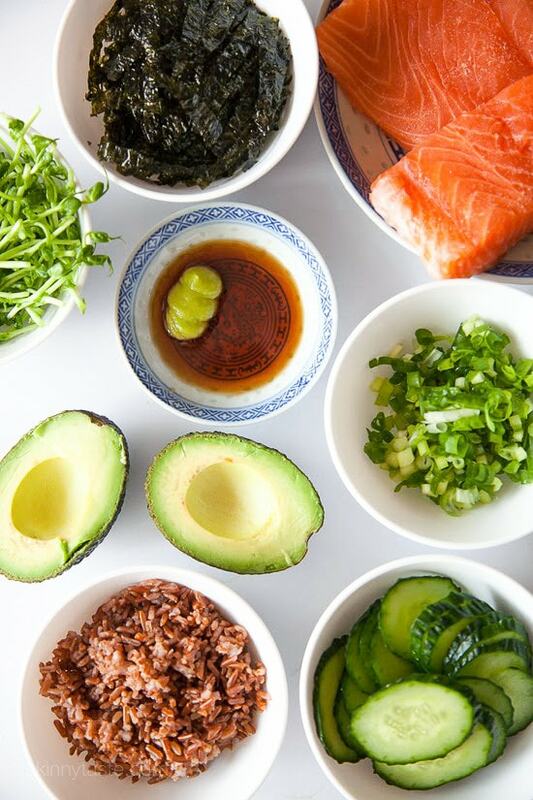 unique flavors and a sumptuous combination of salmon, avocado, rice and wasabi. I will serve it to company soon. Thanks for such a wonderful. And easy to prepare healthful meal! Yum!! 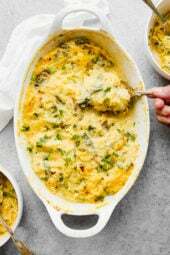 I have made this twice now, and we absolutely LOVE it – so delicious!! I just made this and it was so delicious! This. Is. AMAZINGLY GOOD!!!! Thanks for sharing such an awesome recipe! OMG….this was fabulous! made it last night and will be making it regularly. I never really LOVED salmon until I made this dish. Now, this dish will be in regular rotation! What an excellent dinner! My husband and I loved it, but what was even better was that my 7 year old twins loved it just as much! Will be a regular on our dinner rotation. Keep the amazing recipes coming. I've made so many now and have enjoyed every one. *One key note: I substituted a 1/4 teaspoon of sugar and 1/4 cup of white wine for the mirin since I didn't have it. This dish turned out so well! I ended up substituting the brown rice for a soba noodle, as my fiancé is not a big rice fan. I also substituted the cucumber for fresh bamboo shoots and that ended up being a lovely crunch alternate! The sauce is spot on. I feel sometimes that when I try to cook Asian dishes, they turn out so bland because my sauce is off. It bursts with flavor and will be putting it on a Asian salad very soon! This might be an obvious "no" but would the macros for this change at all if I subbed 16 oz of salmon sashimi instead of searing the salmon? This looks so good but I cannot find daikon radish sprouts. Any substitution suggestions? This recipe was sooo delicious! The wasabi added a nice kick to the flavors, and the dish overall felt healthy yet hearty! O.M.G. This was, perhaps, the best Asian dish I've ever eaten. My husband even said that, too! Keep these yummy dishes coming, please!!! i need a good brown rice. any suggestions? Could I use wasabi powder instead of paste? If so how much? I've been lurking and learning here for a while, but want to tell you that this is truly delicious. Made it last night and my husband and I loved it. This sounds delicious. I need to know, though, if the sesame oil you are using is the toasted kind or the plain kind. Thanks. Made this for dinner last night. DELICIOUS flavors! Substituted seasoned rice vinegar/honey for the Mirin because it contains corn syrup. This looks so good however my family does not eat salmon. Will any other fish work? Thanks! "Fish can be categorized many ways; for example, Mark Bittman, author of How to Cook Everything, divides fish into 11 categories. For simplicity’s sake, we have identified five. Generally, you can substitute any fish within one category for another, although you’ll notice differences in taste. 1. Dark and oil rich: anchovies, bluefin tuna, grey mullet, herring, mackerel (Atlantic, Boston, or King), Salmon, farmed or King (Chinook), sardines, skipjack tuna"
Also, I think tuna would be a great substitution! I have made this several times with Salmon, but last night had a friend for dinner that does not eat ANY fish, so I marinated firm Tofu in the soy-wasabi vinaigrette, pan fried the tofu in a little bit of oil, and it was excellent!! Every morning I look forward to your posts and email newsletter because I know exactly what I'm going to make for supper that night. I love salmon and Asian flavors, so this one I know is going to be a winner. Thanks so much for doing this for us! I love the vibrant colours of this dish, and salmon – I mean, you can't really go wrong, can you? Hi Gina and Family! Speaking of bacon, have you come across any markets that provide natural, sugar-free bacon? I would like to enjoy bacon more often and would feel more comfortable if it were sugar-free. What are you thoughts? Thanks and Happy 2015! Hi Emily – this bacon is antibiotic-free and organic. It has a tiny (less than 2%) amount of sugar in the ingredients, but the sugar grams are still 0. Oh and it is tasty! We just tried the uncured bacon from Whole Foods. Not as salty, although I can't speak to the sugar. Do you think that the sauce would still be good without the wasabi paste? Even a hint of wasabi is distasteful to me (just like my aversion to cilantro). Otherwise, it looks AMAZING! I think it would still be delicious minus the wasibi paste. What brand of brown rice is that in the photo? It looks different than the traditional one I have (darker). Thanks! I'd like to know that too – this brown rice looks much darker than the one I usually purchase. Could you use kale instead of seaweed? The seaweed adds flavor, kind of like a sushi bowl, you can leave it out. Maybe fish sauce or liquid aminos? Doesn't Bragg's have soy in it? 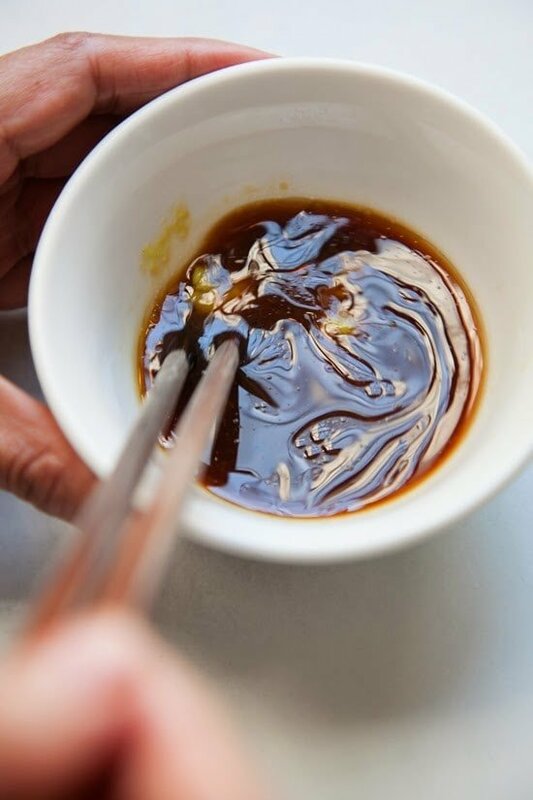 Coconut aminos are a great alternative to soy sauce, but they do taste quite a bit sweeter. You might want to adjust the amount of mirin to compensate. If you can't have soy because of the gluten then try tamari–gluten free.